During spring 2014 we moved our winemaking operations from Santa Rosa to a big warehouse-type building located about three blocks southeast of the Healdsburg town square. It’s an excellent winemaking facility, and we’re very pleased with the move. In connection with the move, we arranged to have two large offices constructed in a corner of the warehouse. Unfortunately, however, there were some unexpected delays in completing all the many things required by the City of Healdsburg’s building permit. As a result, Molly and I moved our desks to our tasting room on a temporary basis, while Lucas set up a temporary desk on the floor of the winery. All of the building permit requirements were finally completed and approved in the fall of 2014, and the City gave us permission to begin using our offices. After some delays caused by harvest and by Molly’s travel to various states to work with our distributors, Molly finally moved her desk from the tasting room to one of the new winery offices during spring 2015. The office to which Molly moved also has a separate desk for me, as well as lots of filing cabinets and the like. Our plan was for me to move back to the winery office soon after Molly’s move. 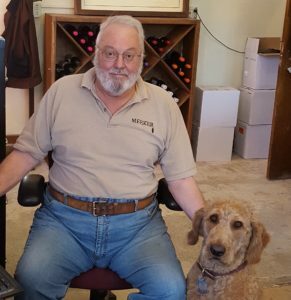 I have, however, intentionally procrastinated in making that move, and I have continued to spend the majority of my office time at my desk in the tasting room, with a smaller portion of my time at the winery office with Molly. Here’s why. I thoroughly enjoy visiting and talking about our wines with our tasting room customers, and in particular with our wine club members. We started our wine club – i.e. the Tribe — about 24 years ago, and it is always a particular pleasure when I am able to visit with Tribe members from way back when. Also, as many of you already know, I love to tell stories about our family’s history with our winery, including buying our first vineyard in February 1977 in Dry Creek Valley, and thereafter establishing our winery during summer 1984. If time allows, it is not difficult for tasting room visitors to entice me into telling one or more of those stories. Last, but by no means least, our son Lucas’ 2014 promotion to being our head winemaker has given me the freedom to work at my tasting room desk for substantial periods of time. Lucas has matured into being a fantastic winemaker! Molly, Kelly, and I are very, very proud of him. Of course, I cannot be at the tasting all the time. There are times when I need to be at my winery office, and I also continue to travel from time to time to work with out distributors. Nevertheless, I plan to continue spending a lot of time at the tasting room, and I very much hope that I am there the next time you visit!